“The most evolved Christmas ornament ever” from the ever-hilarious Archie McPhee in Seattle. May I also recommend the Yodeling Pickle ornament. This entry was written by whyevolutionistrue and posted on December 6, 2018 at 3:00 pm and filed under holidays. Bookmark the permalink. Follow any comments here with the RSS feed for this post. Both comments and trackbacks are currently closed. I’ve got one of those Darwin ornaments. It kind of creeps people out because it gives the feeling of a shrunken head hanging in an old museum display. Also suitable for celebrating Dan Dennett’s birthday. Or, hang him from your rear view mirror all year. Order now and we’ll double your order for a small handling and shipping fee. Buy some for your friends while you still have a few. Operators are standing by. Doc, Grumpy, Happy, Sleepy, Bashful, Sneezy, Dopey and Darwin. The yodelling pickle. The ideal gift for the kids of those in-laws you can’t stand. (A fine sequel to the squeaky toy, the toy hammer, and the trumpet). Oh, and the water pistol or its modern enhanced version, the Super Soaker. And don’t forget the drum kit. Some will know the reference. The Darwin ornament would go nicely with the many other odd and quirky ornaments that we have for the tree. Yule be sorry, associating Darwin with the glitterati, of tinsel, baubles, bright shiny beads and Bling Crosby crooning carols in the background. I wish everybody a joyous abcdefghijkmnopqrstuvwxyz. The Newton ones I just pulled up were weak. I mean there’s a limit to this, right? 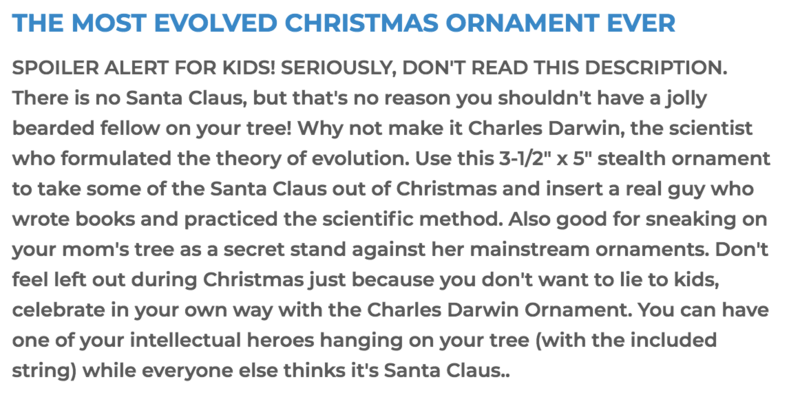 I want that Darwin ornament. I am off to Archie’s tomorrow. Couldn’t the hanging of Darwin’s head make one look as an anti-evolutionist? Doubt if this would turn any heads (ahem), though–most would probably just think it’s Santa. Albeit, Grumpy Santa. Archie McPhee is great! I have the yodeling pickle and it has brought me much joy.